(February 1961 - living) U.S.A.
John McDaniel was born in St. Louis, Missouri. He first studied piano with his mother Jane, and graduated from Kirkwood High School (St. Louis), then earned a BFA degree in Drama from Carnegie Mellon University. 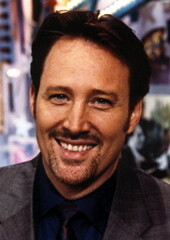 Conductor, pianist, composer, arranger and Grammy Award-winning record producer, John can be seen and heard leading the band daily on "The Rosie O'Donnell Show" (1996) for which he wrote the theme song and has received multiple Emmy nominations for Outstanding Music Direction and Composition. His association with Rosie dates back to 1994 when he conducted the Broadway revival of Grease, in which Rosie played Rizzo. This production, for which John also created new vocal and dance arrangements, went on to become Broadway's longest running revival. In 2001, John added 'Emmy Award Winner' to his long list of accomplishments when the show picked up the prize in the category of Outstanding Talk Show. John is the supervising Music Director of the current Broadway revival of Annie Get Your Gun, which won the 1999 Tony award for Best Revival of a Musical and for which he received his Grammy Award for Best Musical Show Album. He also conducted the current smash hit Chicago on Broadway, the 1993 reunion of the original Broadway cast of Company in concert at Lincoln Center, the U.S. tour of Andrew Lloyd Webber's Starlight Express, off-Broadway's Blame It On the Movies. John has been a featured pops conductor with many symphony orchestras. In addition, he has also enjoyed a long association with Patti LuPone, arranging the show Patti LuPone on Broadway, and having both arranged and conducted the recording of Patti LuPone Live! He has accompanied Ms. LuPone as conductor for many of her symphonic engagements including appearances with the San Francisco Symphony, Charlotte Symphony and the Ann Arbor Symphony. In 1989, he created arrangements for How Do You Keep the Music Playing?, a retrospective on the lyrics of Alan and Marilyn Bergman, performed at the Coast Playhouse in Hollywood. He also arranged music for the Tony Awards in 1997, 1998 and 2000. His most recent arranging and conducting credits for television specials include A Rosie Christmas for ABC, and both the Friar's Roast of Jerry Stiller and the Friar's Roast of Rob Reiner for Comedy Central. John recently recorded his debut solo CD, John McDaniel at the Piano: Broadway. Other recording credits include his role as producer of the Broadway cast album for the revival of Annie Get Your Gun on Angel Records, his conducting of the new Broadway cast recording of Grease on the RCA/Victor label, Patti LuPone Live! on RCA/Victor, as well as of Davis Gaines' release, Against the Tide, on LAP Records. He is the recipient of the Los Angeles Drama Critics Circle Award for his musical direction of Chicago, as well as multiple Drama Logue awards.